I have been thinking about balancing and dropping items (weapons and gear) in the levels. One of the factors is that I cannot make hundreds of items with different stats for each level — I just don’t have the time to do so. So I think the way I will do items is that they will be a mix of designed properties and procedural values based on player’s progress. I will design a good couple dozen unique items. Then drop them in-game with a level that corresponds to player’s current dungeon level. And scale the item’s gameplay values (like damage) according to this level. Items of higher rarity would always win against less rare items of the same level. So the player can use a rarer item for a couple levels past where they found it. One thing is that I am not actually saving player’s equipped weapon, which is a problem I let persist for so long that I have to rewrite the entire weapon storage system. In fact, I am renaming them all to IDs instead of “type”. Naming’s important. I wish I had considered this all before I hardcoded and intertwined so many systems. I guess that’s the bane of not having a proper GDD and design. I wonder what the item rarity drop rate should be. 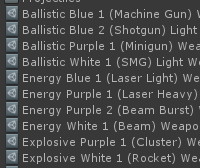 It’s hard to tell without playtesting, but I think it would be something like rare/blue is every 3rd item and epic/purple is every 8th item. The rest are common/white items. I need to decide on this, because that determines how many different items I need for it to feel like there’s a decent selection available. For example, it’s fine if I have many repeats of white items, but I rather have blue items mostly unique and when a player finds a purple, it’s more than likely not what they already had/have. Of course, there will be repeats (and the player may actually want a specific weapon/gear). Then I further need to decide how many items are of certain class, like energy. In short, there are two extremes of items — common and forgettable, and rare and memorable. This is extremely tedious… I am literally drag&dropping hundreds of items between other items. For future projects, I might need to rethink my approach. Unfortunately, I can’t think of anything less tedious in the long run. So this means that, for example, in level 1 white items are predominant and rarely there’s a blue. But in level 10 there are mostly blue items with purples and whites mixed in. So this lets me fine-tune when I drop items. I will need to playtest this to see how the different amounts of items feel. I might write a debug simulator for drops, so I can visually see how items might get generated in the level. But I don’t really think I can get a feel without playing, because the player sees items one at a time between fights as they loot. Ah, much better. DRY as applied to technical design in the works. Finally, I feel like I am actually adding content to the game, even if it’s all just placeholders. There is still a lot to do. And this is really slow and tedious (I use this word a lot, don’t I?). I will likely need to do all the same kind of things for enemies as well.